Picture taken before the disaster. So, here's my SaturdayFAIL story. We'd planned to go to the movies on Saturday morning. Ryan & Brok were going to see Inception (which they said was the best movie ever!) 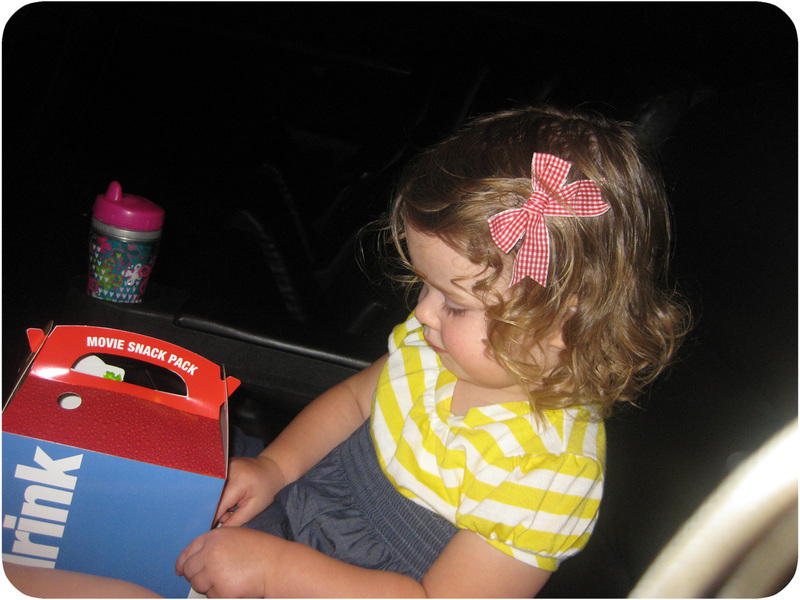 and I was going to take Zoe to Toy Story 3. They started a few minutes apart and they ended at the same time. So we went, all was going well, until the movie started. Zoe was up and down and loud and all over the place. We ended up leaving so as not to disturb the other movie-goers, and headed over to the outlets. It was hot, and Zoe was in a crabby mood. 3 stores, and each one the experience just got worse and worse. Ripping things off the racks, screaming, trying to get out of the stroller...ugh, it was a headache. So I headed for the McDonald's to seek some refuge while the boys finished their movie. That didn't help. She tried to play in the playplace, she was too little to climb the stairs up into the slides, which brought on lots of tears. She tried to eat other people's french fries that had fallen on the floor. Again, more tears from the "No" response I gave her. As we were leaving she fell and skinned her knee. When we got to the car, I discovered she had a blowout and there were no diapers in the car... thanks to my girl scout skills I discovered pj pants + burb cloth = diaper replacement for 20 minutes. Memo to me: Potty Train. Finally we made it home and put Zoe down for a nap, and I collapsed onto my bed and cried from exhaustion. Thankfully my husband was wonderful and took charge the rest of the evening and even did the grocery shopping I was too tired to do. 2 points for Mr. Humbert. I hope you got a chuckle from my SaturdayFAIL, and I hope your Saturday was better than mine. Oh man... I'm so sorry. That's a bummer your day was so crumby! We need to chat soon, it's been too long! Give my high fives to Ryan for scoring good husband points... Hope your weeks goes better! Love you! if it's any consolation she couldn't look cuter in that outfit. also her hair is amazing.